With a houseful of teenage boys, it’s difficult to get ahead. I’m talking about food in this case, although I guess the same statement is true in every area of life in a household full of kids. (I’m looking at you, Laundry Pile. Dirty Dishes. Mail. Shoe Closet.) Bah. This is why I did some freezer cooking a few weeks ago when three outa four of our boys were still at church camp. With hardly anyone here to eat, I actually had leftovers to put in the freezer. Yay me! Almost as important as shredded cheese is the double batch of frozen cookie balls I made. These won’t last long once the boys discover them, but I love that they can take out a few and bake them for an afternoon snack. I used this Chocolate Chip Cookie recipe. I encourage you to read more about why I love them here! You know I didn’t do all of this, all on the same day, right? No way. 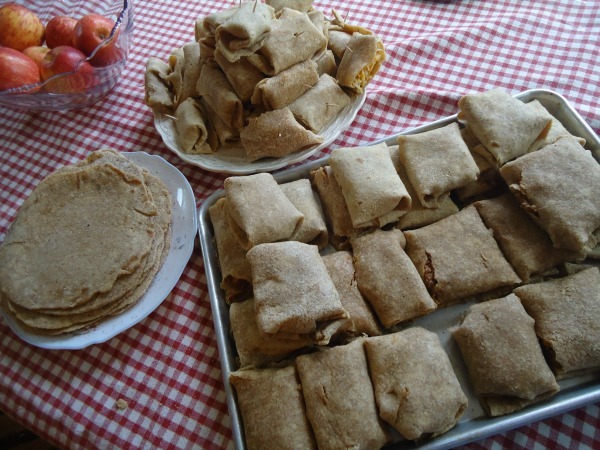 But, there was a day I made not one but SIX batches of homemade whole wheat tortillas. That was a tortilla making record for me! Malachi helped me use the tortillas to make 24 Lazy Dogs and 24 Meat and Cheese Burritos. We still had leftover tortillas for a few quesadillas, so I felt very accomplished that day. I mixed up a double batch of Blueberry Muffins and froze the batter so we can bake the muffins fresh on a school morning. I love this time saving technique! 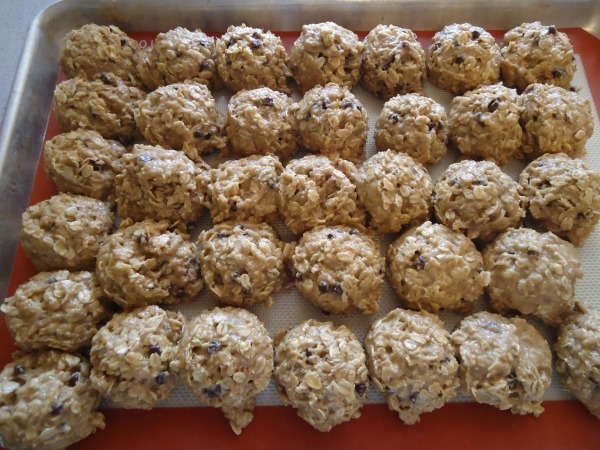 Last, I made a double batch of Giant Breakfast Cookies. 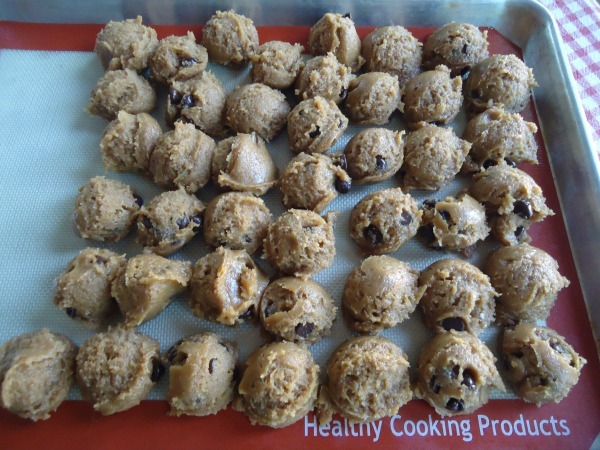 Instead of baking them, I froze them into unbaked cookie balls. This means we can take out a few and bake them fresh any morning we want/need them. I’ll share specifics on how to do this another day soon! I’m hoping to make a triple or quadruple batch of this Real Food “Velveeta” and Rotel Dip for the freezer during the next few days. That will be great to have on hand for Nachos, Spicy Mac and Cheese, or Simple Taco Soup. Now your turn! Have you done any freezer cooking lately? What have you been making in an effort to get ahead before school starts? Way to go Laura! Looks great! Yay for freezer cooking! Last week I made a big batch of gluten free corn dogs for our lunch, and the freezer. 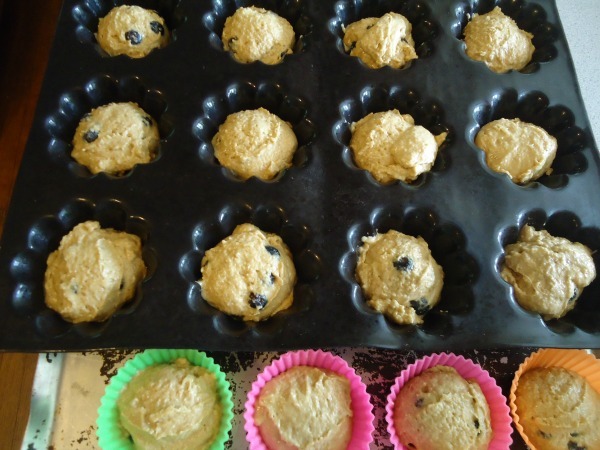 They are a little labor intensive, but so yummy, and now easy to pull out, heat and eat! Grateful I did that before I injured my tailbone. :) I am excited to heal to the point I can bake and freezer cook again. It is such a wonderful thing to find a meal prepped in the freezer. I haven’t made corndogs for the freezer for too long. I need to add that to my list!! Continuing to pray for your healing! We are missionaries on deputation and I have missed cooking so much!! We are starting language school in a week and once we move I am planning a day of freezer cooking before school starts! Thanks for all the great ideas! God bless your journey – I bet you DO miss cooking!! I did cook up 7 pounds of turkey sausage the other day (I don’t get too many gold stars since I only did it because it wouldn’t all fit into my freezer in its original packaging). By the end of that cooking session I was sure I hated sausage, with its stinky smell all over my kitchen and my hair. BUT, we’ve already benefitted and it tasted great, and now you’ve inspired me to get ahead, especially with breakfast on school days (Giant Breakfast Cookies, I’m looking at you)! 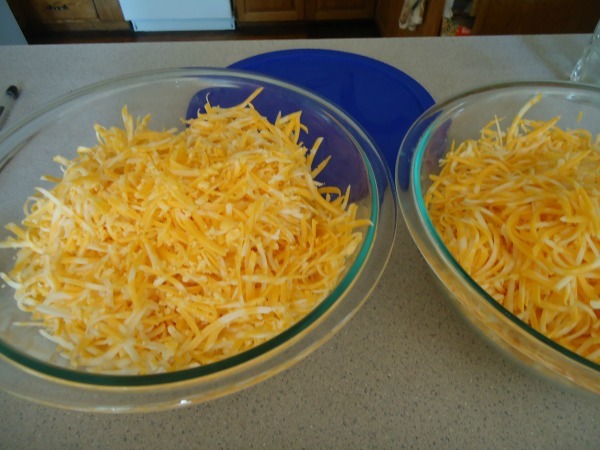 Are you going to freeze the shredded cheese or just leave it in the fridge for the next couple weeks? Great ideas! Our church has started a freezer meal swamp with some of the young moms. It is fun, except there can be a lot of dietary restrictions, which can make it tricky. 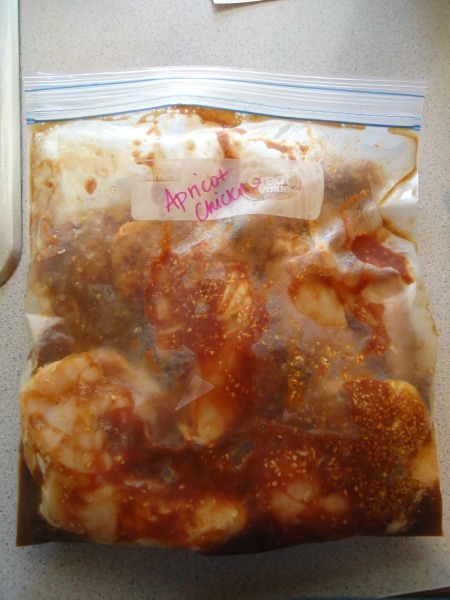 I love having freezer meals of marinated meat to thaw and put in the crockpot! This month I am hoping to organize our freezer better and start stocking it for the busier holiday months. In a couple weeks things will (theoretically) slow down for us for a few weeks, but I know they will speed up with the holidays! I have made batches of freezer strawberry and blueberry jam this summer. I also froze strawberries and blueberries on a cookie sheet to use in smoothies, pancakes, waffles, muffins, and whatever else they are good for! I am waiting for another cheese sale to shred and freeze pounds of that again, as well. Not a lot of freezer cooking as freezer prepping! All that fruit in the freezer sounds awesome! I’ve been freezer cooking for a while now. It saves my life . Homeschooling and 4 kids 11,9,7,5. It’s go time from dawn til 8 pm! I like the cookie ball recipe idea, however, last time I did that, they weren’t in the freezer but one day and I ate a whole bunch…frozen. Delcious! I need to get back on this! I did my best to empty out our chest freezer when we moved 2 months ago, and it has been tough to find the time to fill it back up! Question: How do you cook so much bacon at once? 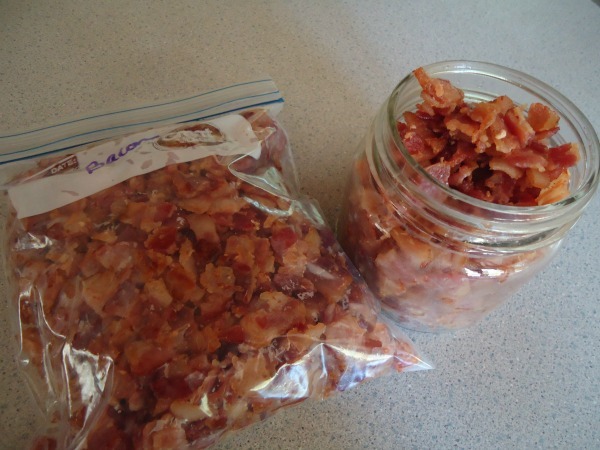 I often cook it in the oven, but each pound of bacon needs a full cookie sheet, so the most I could do is 3 pounds. I LOVE freezer cooking! I haven’t been doing much lately, though. My landlords are trying to sell the house we are renting, and we are looking for a place to buy so…. The idea of having a freezer full of prepped food to move is a bit much for me! Hoping we are done by end of fall, then I can start again!! !